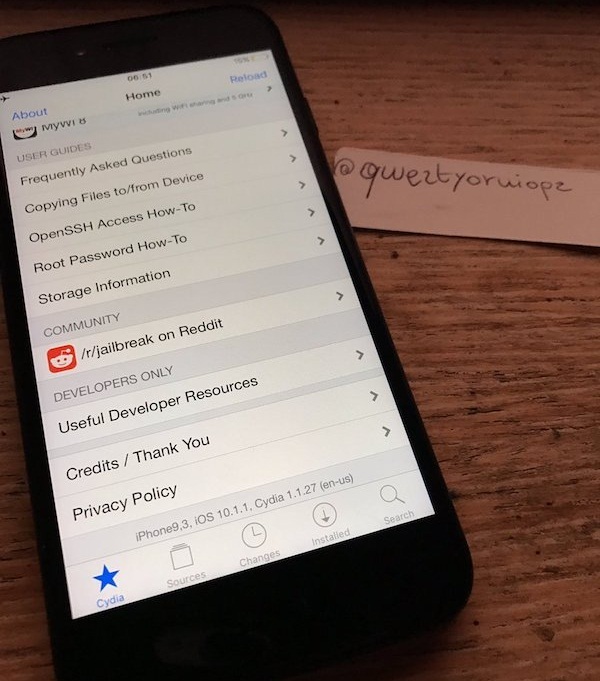 As we already know, Untethered iOS 10 Jailbreak Tool for iPhone, iPad, and iPod touch has been officially released by two prominent members of iOS-Jailbreak community, and now everyone is looking forward to perform iOS 10 Jailbreaking, Cydia Substrate and Cydia Mobile Substrate installation to experience all Cydia tweaks and apps. Before we move forward, it's a reminder for all Apple iOS smartphone and tablet device users to get full backup of your device data before doing anything with this pre-release software. Yalu + Mach_Portal + Extra_Recipe+YaluX Jailbreak Tool with Cydia Substrate support will use Cydia Impactor on Windows and macOS to make your iPhone, iPad, and iPod successfully Jailbroken. Yalu iOS 10 Jailbreak with Cydia Substrate support is currently only compatible with limited iOS-powered 64-bit devices i.e. iPhone 7, iPhone 7 Plus, iPhone 6S, iPhone 6S Plus, iPhone SE, iPhone 6, iPhone 6 Plus, iPhone 5S, iPad Pro, iPad Air 2, iPad Air, iPad Mini 4, iPad Mini 2, and iPod Touch 6G. Whereas remaining iOS 32-bit devices i.e. iPhone 5C, iPhone 5, iPad 4G, and iPad Mini 3 will soon be compatible with this Untethered Yalu iOS 10 Jailbreak Tool. Mach_Portal + Yalu is capable enough to Jailbreak iOS 10.x.x firmware any version released by Apple till date i.e. iOS 10.2 / iOS 10.1.1 / iOS 10.1 / iOS 10.0.3 / iOS 10.0.2 / iOS 10.0.1 / iOS 10. So it's good news for supported iOS device owners, users, and developers. So if you're running Windows or macOS computers or laptops, then follow our working guide and tutorial on How to Untethered Jailbreak iOS 10.2 / iOS 10.1.1 Firmware using Yalu Jailbreak Tool below. "Yalu102 Jailbreak Tool" is compatible with all 64-bit iOS-devices (except iPhone 7/7 Plus), whereas "Yalu Mach_Portal Jailbreak Tool" is compatible with iPhone 7/7 Plus only. Any iOS 32-bit devices are not compatible. Yalu Jailbreak is in early beta stage, so several bugs are expected until final released. Yalu is Semi-Untethered Jailbreak, which means users are required to put device in jailbreak mode after every reboot. A computer with macOS or Windows operating systems. Get complete device data backup using iTunes before you move forward. Step 1: First, connect your supported iPhone, iPad, or iPod touch with computer or laptop using USB cable/Lightning cable. Step 2: Deactivate all kinds of Passwords/Passcode/Touch ID from Settings >> Touch ID & Passcode. Step 3: Deactivate Find My iPhone from your device Settings >> iCloud >> Find My iPhone. Step 4: Download, install and launch "Cydia Impactor" software on your computer. Step 5: Now, drag and drop the downloaded "Yalu102 .IPA" OR "Yalu + Mach_Portal + Extra_Recipe+YaluX .IPA" Jailbreak File on Cydia Impactor software. Step 6: If asked, insert your iOS-developer's Apple ID or Free Apple ID into box. Step 7: Let Cydia Impactor software to install the Yalu Jailbreak App onto your iOS device. Step 8: After "Yalu102" OR "Yalu + Mach_Portal" app installed successfully, disconnect your iOS device from laptop or computer, then instantly navigate to Settings >> General >> Profile(s) & Device Management or General >> Device Management and press "Trust" and then Trust again on the certificate you used to install this Yalu102 or Yalu Mach_Portal Jailbreak App. Step 9: After this, you will see the "yalu102" OR "mach_portal" jailbreak app on device Home screen. Press and launch "yalu102" OR "mach_portal" icon and wait 5 to 10 seconds to get things done itself. After few seconds of open and closure of white screens, you will get "Cydia" app installed and appears on device Home screen as well. Now you can open "Cydia" icon too for confirmation of iOS 10.2 Jailbreaking OR iOS 10.1.1 Jailbreaking. If Cydia doesn't work or display, hard-reboot your device, and you will surely get Cydia installed. Congratulations!! You're done. Note: Since Yalu102 and Yalu Mach_Portal is a Semi-Untethered Jailbreak, so all iPhone, iPad, and iPod touch device users will be required to put device in Jailbreak mode again after every reboot or restart. To put your device into Jailbreak Mode again, just re-run or launch "yalu102" OR "mach_portal" app again after reboot / restart. If you have used iOS-developer Apple ID for jailbreak process, then your certificate will be expired after one year, and if you have used Free Apple ID for jailbreak process, then your certificate will get expired every seven days, after which you will have to perform Re-Jailbreaking of iOS 10.x.x Firmware again from Step No. 4 onwards. Don't worry; you won't lose any data, apps, settings, and tweaks while doing iOS 10 Re-Jailbreaking.